Cost-saving– The large up-front capital expenditure can be turned into ongoing, smaller operational cost without any bulk investments in new software and hardware. Business continuity– In cloud computing, the service provider manages the technology, and banking firms can have higher levels of fault tolerance, data protection and disaster recover. Cloud computing also offers a high level of back-up and redundancy at lower cost. Usage-based billing– Institutions can pick and choose the services based on pay-as-you-go basis. Business agility– As the cloud is available on demand, the infrastructure investment is minimized, saving the time for initial set-up. The development cycle for the new products is reduced, leading to more efficient and faster response to the customers. Business focus– Financial firms can move non-critical services such as software patches, maintenance etc. to the cloud, and can focus on their core business areas, not IT. Green IT– Transferring banking services to the cloud reduces carbon footprint and energy consumption, and there is minimized idle time with more efficient utilization of computing power. BPaaS– Business Process-as-a-service- Used for general processes such as payroll, billing, human resources etc. SaaS– (Software-as-a-service) – Users can access the software and data from their browser, and business software and related data are housed by the cloud service provider. Accounting, enterprise resource planning (ERP), customer relation management (CRM), human resource management, invoicing, service desk management and content management software can be delivered using this model. IaaS (Infrastructure-as-a-service) – Rather than purchasing software, servers, network equipment or data centre space, the businesses can buy these resources as fully outsourced services. 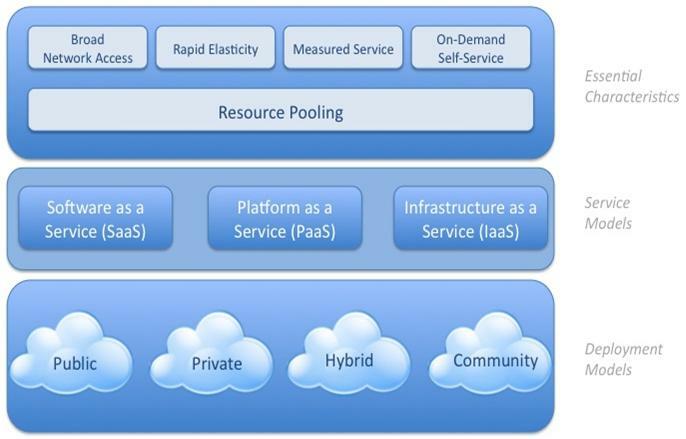 PaaS( Platform-as-a-service) – In this model, the cloud service provider offers a complete platform to the businesses to develop , run and manage their applications without engaging in the infrastructure complexities associated with application development and launch. There are three types of commonly deployed clouds. Private cloud is operated specifically for a given company and is most secure of all options. The company may exist on or off the premises, and can be managed either by the company, or by a third party. Public clouds are for a large industry group or for the general public, and ownership lies with the cloud service seller. Hybrid infrastructure consists of two or more public or private clouds that are linked but remain unique entities. Banking industry needs to address the ever-growing data input demands, and there is a need to explore the systems that do not rely on like-system migration so that infrastructure can be modified without any disruption. Banks have been slow in adopting cloud computing as there are apprehensions regarding lack of control and environment sprawl which can lead to reliability issues and security risks. Banks also want their financial data to be secured with controlled access. Public clouds come with the issues such as location, regulation, recoverability and liability, and this has led to slow adoption and deployment of cloud computing in the banking sector. However, cloud computing can change the way consumers interact with banks, and migration to the suitable cloud computing model offer several benefits. Understanding the migration and entire process of migration can be quite beneficial in the long-term. The first step for the banking firms towards cloud computing adoption is opting for the private cloud as it gives banks more control, increased flexibility and reduced complexity. The banks can also alter their resource configuration to match the changes in the demand of their services. The risk of security breach in the private cloud is minimized as it is deployed within the firewall of the organisation. Using VPN (Virtual Private Network), the IT infrastructure of the company can be easily and quickly moved over a single private network. Using private clouds, banks can operate at high transaction volumes without slowing the processes and without overloading the network. The services become more efficient due to dedicated resources of each unit, improving the customer experience. Private clouds offer safety and affordability as the resources are rented, and not purchased. The total cost of ownership is reduced as the capital expenditure is converted to the operating expenditure. Private clouds are safe, affordable and enable easy transition in banking leading to long term success. Banking sector applications are very critical, private clouds provide increased security to ensure that the data is not misplaced or lost. Public clouds offer economies of scale, cost benefit and ROI, whereas private cloud offers high levels of security. Given the concerns regarding control and security, banks can opt for incremental approach which involves using cloud computing to the non-core operations initially, and gradually move more and more operations and processes to the cloud depending on the benefits. Banks need to work on cloud reference architecture, and try to achieve business agility for business model transformation. As there is no one-solution-fits-all option available, banks need to consider few key aspects. It is essential to thoroughly evaluate all the challenges and advantages associated with cloud computing with respect to their complete range of services- core and non-core. Additionally, geographic regulations, penalty clauses, business criticalities, interoperability and interface impact, audit requirement mandates, and technology are some of the aspects that must be thoroughly assessed. Choice of the cloud model must be evaluated based on the control of the governance and support provided by the service vendor. Non-core banking applications that do not need strict governance and stringent monitoring are suited for SaaS model, whereas IaaS is more suitable for the business critical applications that need to be closely monitored. Banks must keep in mind that the vendor must provide transparency in the security procedures and policies. Banks these days offer a plethora of services, and hence they have varied requirements regarding the movement of applications to the cloud. Cloud computing can help banks create more agile and flexible business offerings for the competitive and growing markets, and help them transform their business processes. They can explore and grow into the new markets and sectors, and improve their services to the customers across different geographic locations, and integrate customer information and analytics.